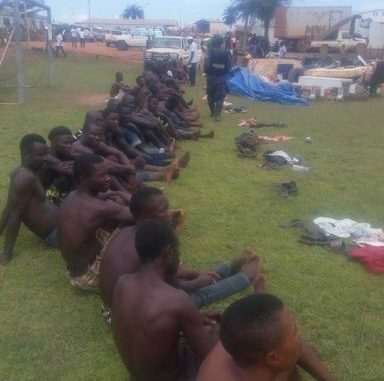 Police in Bong County have formally charged sixty seven persons with multiple offenses and sent them to court for prosecution following serious looting at Mining Company MNG Gold in Kokoyah District. The charging of the suspects follows preliminary Investigations after the Monday November 5, 2018 mob violent action at the company that led to the looting of the facilities of MNG Gold in the area. According to Police sources, the suspects who include 64 men and 3 women were charged with armed robbery, rioting, arson, burglary. Criminal conspiracy, criminal mischief and theft of property after preliminary Investigations linking them to engaging in the looting and vandalism. Police records show that after the accident that led to the deaths of four persons, the suspects subsequently set ablaze the company’s vehicle and later conspired to loot its facilities. Some of the suspects admitted being on the scene of both the burning of the company’s pickup involved in the accident and looting of the facilities, according to Police records. But they denied playing any role in the acts. The accident occurred when a Toyota Hilux Pickup belonging to a Chinese firm contracted by MNG Gold ran into a commercial motorcycle, killing the rider and all three passengers. Few minutes later, an angry mob set the vehicle ablaze and later moved onto the Company’s facilities close to the accident scene and carried our massive looting of the Company’s properties. Several employees of the Company reported that the crowd cut off the entire electricity supply in the company’s compound for several hours while the looting was taking place. The situation was brought under control few hours later through the help of Police Support Unit (PSU) officers from the Gbarnga Regional Justice and Security Hub who responded to avoid further damage. Police in the early hours of Tuesday November 6, 2018 initially arrested 55 based on footage from the CCTV security Camera, while 12 others were arrested later. This is the latest in a series of mob violence incidence seen across Liberia. Bong County Police Detachment Commander, Col. Fredrick Nappy, who was in the area with a team of Senior Police Officers from Monrovia, told ourBong County Correspondent that the Company’s entire facilities were looted. On Tuesday, Internal Affairs Minister Varney Sirleaf, Bong County Superintendent Esther Walker and the Chairman of the Bong County Legislative Caucus Senator Henry Yallah as well as Representative Albert Hills, who represents this District in the House, visited Sayewheh town and the Company’s facilities. The officials said their visit was part of efforts to get first hand information about the overall situation in the area. During a meeting with the citizens in Sayewheh, Minister Sirleaf and other officials assured the locals that all will be done to ensure their relatives killed in the motor accident are given a befitting burial. Before the accident, there had been growing tensions between the people of Sayewheh Town and MNG Gold for several months over allegations that the Company was not living up to the implementation of projects under the mineral development agreement (MDA) and the Memorandum of Understanding it signed with the citizens, allegations the Company has persistently denied.